Karnak - Built during the Middle Kingdom, Karnak became Egypt's most important religious center. It is a complex of temples, sanctuaries and other buildings where Egyptians honored their gods. The site was an extension of Thebes which became Egypt's capital during the Middle Kingdom (remember that Memphis was capital of the Old Kingdom). The main center of worship was dedicated to the god Amun who was the patron deity of Thebes. 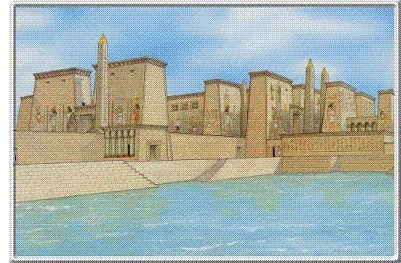 Although dating back to the Middle Kingdom, most of the buildings which survive today are from the New Kingdom.